In this paper, solid-state NMR investigations of polyamide 11 (PA 11) films are presented. 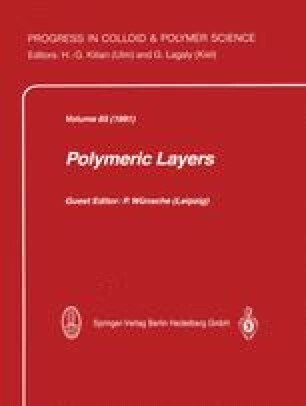 This polymer is semicrystalline and can exist in various crystalline polymorphs. Polymaide 11 shows interesting electric properties. The piezo- and pyroelectric effects of this polar polymer are comparable with those of polyvinylidenfluoride (PVDF). Multiple pulse 1H-NMR and 13C CP/MAS NMR measurements are used to investigate the influence of the preparation conditions (thermal, mechanical, electric effects) on the morphology of PA 11. Various preparation procedures provde film material with predominantly a — and γ crystallites, respectively. The 13C NMR spectra and IR measurements support the assumption of the co-esistence of various crystalline polymorphs. The chemical shift patterns are different for the various crystalline modifications. Separated 13C NMR spectra are recorded for the crystalline and amorphous parts of the films. Orientation effects due to the mechanical strechting and the poling in electric fields are reflected in the results of the 1H NMR multiple pulse investigations.